More air quality index data for the state of Maryland can be found on the Air NOW website. EPA has assigned a specific color to each AQI category to make it easier for people to understand quickly whether air pollution is reaching unhealthy levels in their communities. Each category corresponds to a different level of health concern. "Good" The AQI value for your community is between 0 and 50. Air quality is considered satisfactory, and air pollution poses little or no risk. "Moderate" The AQI for your community is between 51 and 100. Air quality is acceptable; however, for some pollutants there may be a moderate health concern for a very small number of people. For example, people who are unusually sensitive to ozone may experience respiratory symptoms. "Unhealthy for Sensitive Groups" When AQI values are between 101 and 150, members of sensitive groups may experience health effects. This means they are likely to be affected at lower levels than the general public. For example, people with lung disease are at greater risk from exposure to ozone, while people with either lung disease or heart disease are at greater risk from exposure to particle pollution. The general public is not likely to be affected when the AQI is in this range. "Unhealthy" Everyone may begin to experience health effects when AQI values are between 151 and 200. Members of sensitive groups may experience more serious health effects. "Very Unhealthy" AQI values between 201 and 300 trigger a health alert, meaning everyone may experience more serious health effects. "Hazardous" AQI values over 300 trigger health warnings of emergency conditions. The entire population is more likely to be affected. 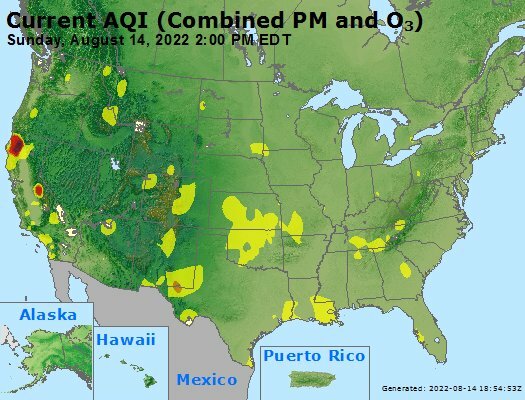 For more information on air quality and air pollution visit the Environmental Protection Agency (EPA) website. The EPA AirCompare website provides comparing the number of unhealthy days for each county over previous 10 years and by monthly average. These levels are based on outdoor exposure to natural occurring spores in the environment. Indoor mold levels will vary from building to building. Information about mold spore as a health hazard can read on the Centers for Disease Control and Prevention (CDC) website. Also some good information is available on this AccuWeather website. As the seasonal outbreak of the flu virus continues, you can check for the activity in your state of the current and past Influenza (flu) Seasons. Information about the current flu virus spread is provided by the Centers for Disease Control and Prevention (CDC).